During the 1950s, Douglas Sirk directed some of the most popular Hollywood melodramas, but was maligned by critics of the time. It wasn’t until years later when the Cahiers du cinema critics re-evaluated Sirk’s body of work and argued that he was as much of an auteur as John Ford or Howard Hawks. All That Heaven Allows (1955) was made at the height of his popularity and despite its formulaic story has a strikingly distinctive look that is vintage Sirk. The opening credits play over an elegant panning shot of a postcard-perfect Everytown, USA. It’s exactly the image we think of when ‘50s suburbia is mentioned. Cary Scott (Wyman) is a widow whose children have grown and live away from home. She has plenty of time on her hands. Her best friend Sara (Moorehead) even tries to set her up on a blind date, but she finds herself attracted to Ron Kirby (Hudson), the hunky gardener who does the landscaping on her property. Their burgeoning romance causes quite a stir in the small town as there is a significant difference in their ages and he’s a landscaper while she is a well-to-do middle class widow. Will their romance survive the prejudices of others? 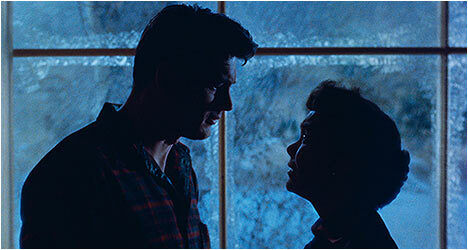 With the help of master cinematographer Russell Metty (Touch of Evil), All That Heaven Allows is bathed in atmospheric light, like the blue shadows that dominate Cary’s bedroom as she gets ready for a dinner party or the fantastic contrast of colors, like the warm, gold of her house when she sees off a potential suitor on the front door bathed in cool blue. The film is awash in vibrant Technicolor. Among other things, All That Heaven Allows examines the prejudices of the middle class and how some of Cary’s friends look down on people like Ron. To these people, handymen and gardeners are fine so long as they know their place, but she runs into trouble when he dares to get involved with someone outside of his economic class. Sirk shows just how cruel the middle class can be to those below them. He makes it apparent who he prefers in the warmth and energy that is conveyed in the scenes with Ron and his friends. All That Heaven Allows is one of the best melodramas to come out of the ‘50s and serves as a fascinating snapshot of the beliefs and social mores of the time in which it was made. This Blu-Ray upgrade is simply stunning in the way it shows off Sirk’s trademark Technicolor look in all of its vibrant glory. There is an audio commentary by film scholars John Mercer and Tamar Jeffers-McDonald. They talk about how color and costumes are linked to characters and invested with meaning. They examine the Technicolor look and how it made the color red pop, for example, which is the dress Cary wears at a dinner party. Mercer and Jeffers-McDonald discuss the subtext of the All That Heaven Allows, in particular Sirk’s critique of middle class snobbery. This is quite an informative track. “Rock Hudson’s Home Movies” examines the actor’s sexuality and how it impacted his life and career. Professionally, Hudson was not “out of the closet,” but was in his personal life. This featurette uses clips mixed with voiceover narration to show how the actor conveyed his homosexuality in his acting through subtext. “Behind the Mirror: A Profile of Douglas Sirk” features excerpts from a 1979 BBC documentary on Sirk. It takes an excellent look at his fascinating life and career as he talks at length about how one informed the other and vice versa. “Contract Kid: William Reynolds on Douglas Sirk” is an interview with the actor who played Jane Wyman’s son in All That Heaven Allows. He talks about his work with Sirk and, in particular, the film while also offering impressions on the director’s style. Finally, there is “Cinema Cinemas” an interview with Sirk that originally aired on French television in 1982. In the twilight of his life, he looked back on his career.